As a leader in industrial grating, our team at Marco Specialty Steel is proud to offer you a wide range of grating products to cover all of your needs. We’re constantly adding to our lineup to give you more choice. We have the advantage of not only being a supplier, but also a fabricator. 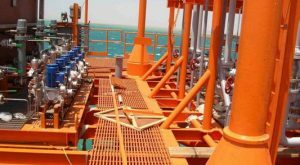 We offer Phenolic FRP Grating for harsh environments where both safety and corrosion are concerns. One of our growing product lines is our phenolic fiberglass grating. Available in two forms — molded and pultruded — we offer many standard dimensions, including 24”, 36”, 40” and 48” widths and a variety of lengths. Our phenolic FRP grating is extremely resistant to wear, heavy loads, corrosion and temperature extremes. You can install it on walkways, crossovers, work platforms and bridges. Phenolic grating works well in industries such as public buildings, public transportation, tunnels, mining, refineries and marine and ocean vessels. The inclusion of phenolic in the resin has several advantages, with the greatest being fire resistance. At elevated temperatures, the phenolic protects the plastic and fiberglass from becoming soft and flexing. 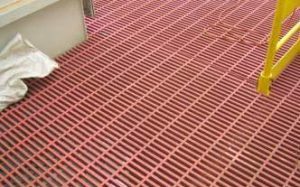 The added cost of phenolic is offset by the durability of this grating system, which can give years of reliable surface and wear resistance with no maintenance. As a fabricator of our own products, Marco can custom make grating according to your requirements. You can choose from our standard phenolic FRP products or we can custom-make a variant that suits your application perfectly. Whether you need simple cuts or have a complex fab job, our expert fabricators can make a phenolic mezzanine or custom cut stair treads to your specifications. Marco Specialty Steel’s phenolic grating is approved by U.S. Coast Guard by surpassing both level 2 and level 3 tests. The USCG test requires sample grating to be exposed for one hour as per ASTM E-119. The sample that we supplied carried 140 psf uniformed load during the test, exceeding the requirement of 94 psf by a factor of 1.49. This extreme testing gives you confidence that our phenolic grating can take the abuse you throw at it. The strength comes not only from the materials we use, but also from the intelligent design we apply. We can offer you phenolic FRP grating with a range of opening sizes that increase strength while allowing dirt, debris, rain, wind and snow to pass through. Our grating can also include increased adherence for safe walking. Marco Specialty Steel provides only one style of USCG molded grating: phenolic superspan 1.5″ x 1.5″ x 6″. 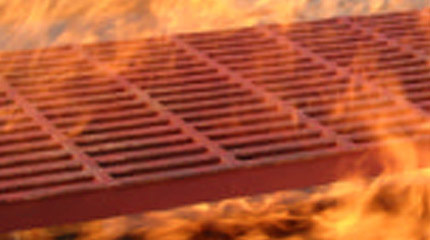 The grating can be used in cases where more pipe penetration or cutout is required. PHM-1.5-1.5.-6 1.5" 1.5" x 6" 0.6" 55% 3.90 lbs/sf 4' x 12' 0.5"
We offer only one style of USCG pultruded grating: phenolic I-beam 1.5″ -60%. The grating can be used in cases where greater span is required owing to environment or construction. FRP gratings are not specifically addressed in the individual vessel regulations. 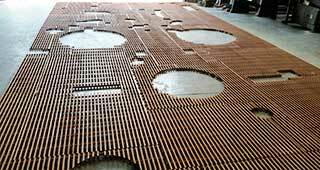 However, the resins typically used in the manufacture of these gratings are combustible and heat sensitive; therefore, FRP gratings use must be limited based on the requirements below. These requirements are not intended to eliminate any other design criteria or requirement pertaining to the material, construction, or performance of the FRP gratings in the non-fire condition. Level 1 (L1): FRP gratings meeting the L1 performance criteria are intended to be satisfactory for use in escape routes or access for firefighting, emergency operation or rescue, after having been exposed to a significant hydrocarbon or cellulosic fire incident. In addition they are also acceptable for the services and functions described for levels L2 and L3. Level 2 (L2): FRP gratings meeting the L2 performance criteria are intended to be satisfactory for use in open deck areas where groups of people are likely to assemble such as temporary safe refuge or lifeboat embarkation areas. In addition they are also acceptable for the services and functions described for level L3. Level 3 (L3): FRP gratings meeting the L3 performance criteria are intended to be satisfactory for use in egress routes and any areas that may require access for firefighting, rescue or emergency operations during exposure to or shortly after exposure to a transitory hydrocarbon or cellulosic fire. We invite you to contact us today for a free quotation. You can give us a call or upload your designs and blueprint files directly to our site. Our team will analyze your project and requirements and find the right phenolic FRP grating system for your application. Come and find out how we’ve become and industry leader with our high-performance phenolic fiberglass grating products.